Carbon steel fibers have been used successfully over the last 30 years. Normal reinforcing such as rebar tend to only reinforce concrete in tension. The addition of Flex-Ten® steel fibers instead of rebar or wire mesh will create a concrete with much more plastic and ductile properties. By adding Flex-Ten® Steel Fibers you create a 3-Dimensional matrix similar to that of the aggregate throughout the mix. When reinforced in all directions you end up with a superior concrete design. Pads will bend instead of crack. The addition of 1" long steel fibers will increase flexural and bending strength by 1.5 to 3 times that of standard reinforced concrete. 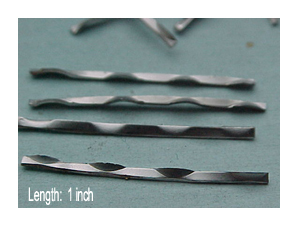 Steel fibers reinforce in three dimensions throughout the entire matrix. They restrain micro-cracking by acting as tiny reinforcing bars. The earlier a crack is intercepted and its growth inhibited the less chance it will develop into a visual crack or problem. And what about cracking? Concrete has always been unpredictable material and no methodology can entirely eliminate cracking. Using SFRC (steel-fiber reinforced concrete) offers an extremely effective means of controlling cracks. This together with proper sub-base preparation and curing methods are essential to overall job performance. There are many other uses’s out there. Did we mention that the superior performance will save time money and reduce maintenance over the life of any installation. With the current price of steel going thru-the-roof, Flex-Ten® Steel Fibers can offer a practical alternative to standard reinforcing methods. Must use a plasticizer for increased workability. Flex-Ten® Steel Fibers come packaged in 50lb. Ctns. 48 ctns. Per pallet = 2,400lb. Truck-load would be 18 pallets 43,200lb. Click here to download our SDS Safety Data Sheet (for Carbon Steel).